I’m so excited about today’s tutorial because not only is it cute for school but also stays in really well making it perfect for every day! Step 1 / Start by dividing off a section of hair at the top of the head and tie it off with a clear elastic band. Take a small section of hair, wrapping it around the elastic band to hide it and secure it underneath with a bobby pin. Step 2 / Now divide the wrapped section into two equal pieces. 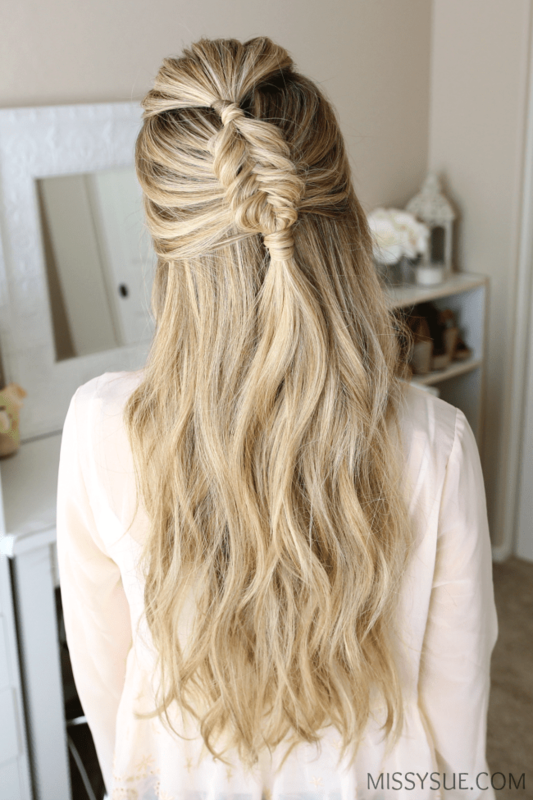 Braid it into a dutch fishtail braid by crossing small sections from the outer edges under to the opposite side while incorporating hair into the braid. Step 3 / When the braid reaches the top of the ears, braid a few more sections of a regular fishtail braid, crossing the side strands under to the opposite side without bringing in any new sections. Then go back over the braid and gently pull on the edges to make it a little fuller. Step 4 / Grab another elastic band and tie off the braid. Step 5 / Take a small section of hair, wrapping it around the elastic to hide it. Step 6 / Grab your favorite straightener and smooth out any kinks or add in some soft waves with a curling iron. I love this style for school but think it would be a cute look for wearing as a casual style during the week. Be sure to pin your favorite image and share with a friend and I’ll see you next weekend for a new tutorial! Hi Missy! I am Siti frm Singapore n i luv ur hairstyles! Is it ok if u do a hairstyle of mermaid braid, pigtail version?